What was once lost is now found – and now shared. 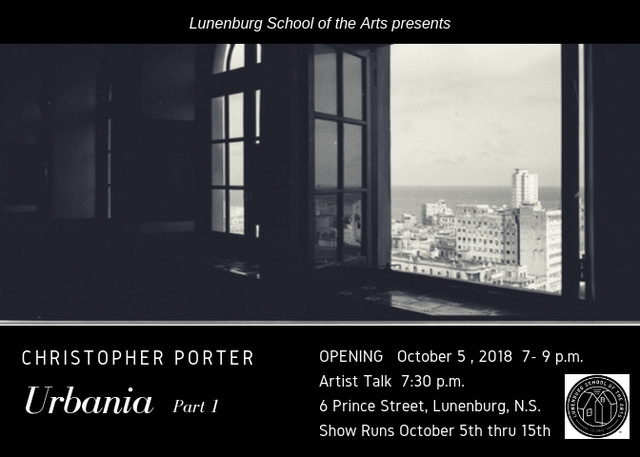 Lunenburg School of The Arts is proud to present ​Urbania Part 1,​ a solo photographic exhibition by fine arts street photographer Christopher Porter on October 5, 2018. The collection is black and white, shot on X-pan and 35mm, and presents 20 of the 60 images that comprise this body work and is the first of multiple collections recovered and currently being restored. The exhibit is especially profound for the artist as it holds work he never expected to see again. The collection’s debut takes place in his hometown of Lunenburg, Nova Scotia, Canada. Urbania Part 1​ opens October 5 at the Lunenburg School of the Arts, located at 6 Prince Street in Lunenburg, Nova Scotia, Canada. Visitors are invited to join photographer Christopher Porter and view his work from 7-9 p.m., and to attend an artist talk and reception at 7:30 p.m. ​Urbania Part 1​ is open to the public daily 10:30 a.m. – 4:00 p.m. until Saturday, October 13th, 2018.